Information about Jon Filson can be found here. 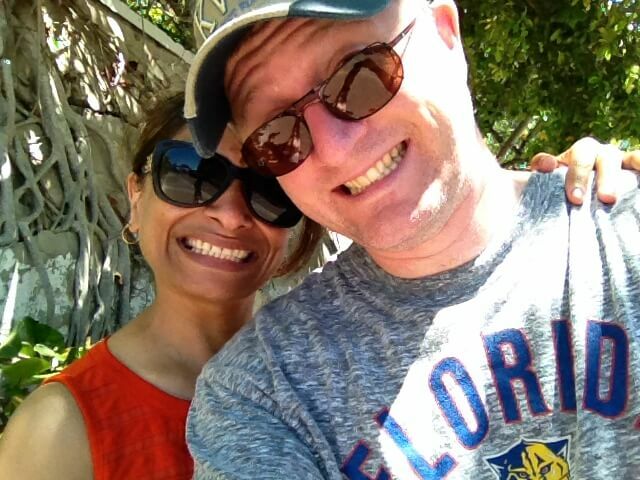 Photograph courtesy of Jon Filson Raveena Aulakh and Jon Filson on vacation in 2015. Raveena Aulakh deserved better. I’m forever sorry to her, and to everyone affected by her loss—especially her family and the people who tried to help her most. I will always wish she had made another choice. And that I had made different choices. Reporting on suicide is difficult. In this case, the explanation that has been presented is that an admittedly terrible break-up caused a forty-two-year-old, highly skilled reporter, an educated and capable woman, to take her own life last month. I doubt any mental health expert would say that is a complete explanation, but the stigma that surrounds reporting on this issue means we allow simple explanations where they do not exist. I will always wish our private lives had remained so. Large parts of what I am writing here should have always remained our own. We loved and cared for each other as best as we could. Unfortunately, neither of us was very good at it. I feel forced into trying to explain as best I can. Some of what has been written is true. Some of what has been written is not. In other cases, omissions have not helped, but hurt, a better understanding of what occurred. My relationship with Raveena began while I was married. It was a mutual relationship. She never worked for me the entire time it went on. I have been legally separated since August 2014, with my ex-wife moving out shortly after. We ended our marriage mostly because I was a poor and often absent husband to a good person who deserved better, and in part because I wanted to have a relationship with Raveena. Despite being born on other sides of the world, Raveena and I found we had much in common. We were roughly the same age. I’m forty-two. We both earned graduate degrees in journalism. We both moved to Toronto to work for the Toronto Star. We discovered that neither of us used the subway our first year in this city, because we couldn’t quite figure it out. We met at work, but our jobs were not a large part of our lives together. Our relationship began in early 2011, while I was sports editor and she worked as a city reporter. Throughout, the relationship was never stable, always chaotic. Raveena dropped me many times, for varying lengths of time, both before and after the end of my marriage. Sometimes I asked her to come back, sometimes I let go. We loved and cared for each other as best as we could. We both tried. Unfortunately, neither of us was very good at it. Both of us were married when our relationship began. Raveena briefly mentions her marriage in a story written mostly about her relationship with her grandparents, forever pinned to the top of her Twitter account. Her husband was in India, which Raveena had left in 2006. Raveena remained married, on paper, throughout our relationship. She had reasons to stay that way; I had reasons to want otherwise. My point here is only to say we weren’t disagreeing on what dish soap to buy. Our issues were adult, complex, and ultimately impossible for us to resolve. This next part is hardest to write because of the unfair stigma attached to mental-health issues. Not many people knew what she was going through. But everyone who knew did their best to help. Both Raveena and I sought and received professional help. When we began to split up last fall, I helped her find a therapist. I tried to support her. I soon understood how hard everything was for her and urged her to continue in therapy, which she did. In January, as our issues remained unresolved, I also went to a therapist and followed his advice. I have seen him regularly since. Throughout the relationship, we could get to a good place for a little while, but we just couldn’t stay there. Raveena and I were never able to discuss the major issues in our lives. We couldn’t figure out how to move forward. My marriage had taken a long time to end, and the topic was so loaded we couldn’t talk about it even after it was over. As my wife and I separated, my world became small. My relationship with Raveena did not improve the way I thought it would. I worked long hours and life seemed difficult. As has been reported, while seeing Raveena, I had a relationship with Jane Davenport, the Star’s managing editor at the time and my boss. I connected with someone who I knew was a good person. We spoke about our personal lives and that relationship eventually crossed lines. It is not an excuse, but it is what happened. I am sorry to Raveena for all of this. I am sorry too that another person was involved. She also deserves better. When Raveena discovered evidence of my relationship with Jane last October, our relationship began to unravel completely. Other elements haven’t been written about. It would be recorded in India that Raveena’s grandfather died last Fall, at the same time our relationship began to fall apart. The same article pinned to her Twitter account, mentioned above, explains how Raveena was raised by her grandparents. She describes in the article how the death of her ammi—her grandmother—affected her when it happened in 2009. Raveena and I last were in contact in early May, three weeks before she took her life. These have been the worst days of my life; I know the last weeks for her must have been worse. I didn’t respond to stories or comments or anything targeting me on social media because of the shock of what has happened. In total, two journalists asked me for comment. I have been at home, mostly alone, trying to come to grips with everything that has gone on. Both Raveena and I were once private people. After trying to explain and apologizing, I hope I can become one again. So much has gone away so quickly. I don’t know what I will do now. I am grateful to all the people who reached out to me and who heard me out, who have offered support, advice and let me grieve. Many asked me to explain. Some chose not to be my friend after we spoke. Some did. I understand both sides.